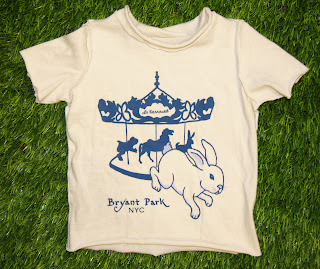 Bryant Park Blog: Bryant Park Babies: The T-Shirt Sale! Bryant Park Babies: The T-Shirt Sale! This one's for the babies: deck out your little one in our Le Carrousel Baby T-Shirt for less! Regularly $23, these tees are now on sale for $15. 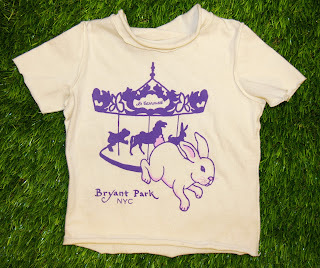 Great for baby showers, gifts for newborns, or a grandparent who loves to stroll with the grandchild in the park, the Le Carrousel Baby T isn't just cute, it's also the most comfortable T-Shirt you'll ever put on your little one. Made in collaboration with Teres Kids, a company that works with a family-owned textile mill in South Carolina and uses almost 100% organic fabrics, Teres Kids T-Shirts are designed so nothing scratchy is against your baby's skin. These shirts are tag-free, printed with non-toxic dye, have raw-edges, exposed seams, and a wide, rolled collar for easy baby dressing. Update: the baby T sale has ended, but stay tuned here and on our facebook page for our next sale on August 8th!